Keywords are phrases in your website content that make it possible for people to find your site in a search engine. A high ranking website does its research to find relevant keywords for its niche and also ‘speaks the same language’ as its target audience. 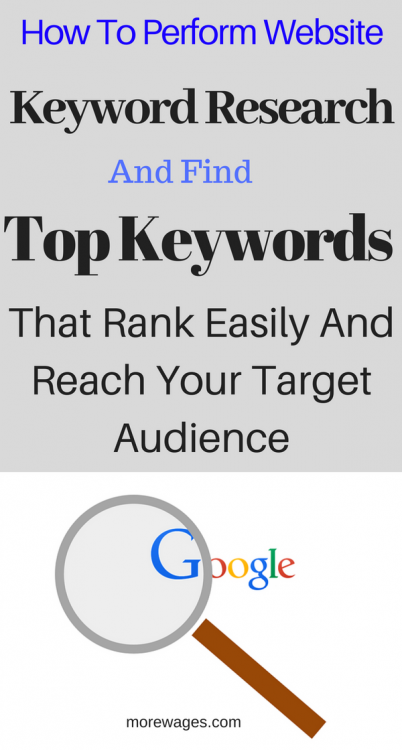 Put simply, a keyword is any word that your visitors type in google to find your site. As a blogger, your primary reason for keyword research is to find what your readers are looking for and create content around that keyword. I’m going to talk you through the process of research and explain why Keywords are so important. SEO (Search Engine Optimization) is basically a variety of techniques used to increase the number of visitors to a website by achieving high ranks in search engines such as Google, Yahoo, Bing etc. SEO works miracles for any type of business done online because it has a direct impact on readership, sales, and raking. If done properly and in right measures you can take your website from non-existent to top page rankings! Making your website more accessible and easy to find means the greater the chances of having an increase in business. Strong content goes into depth about its particular topic, the more informative and useful the more people will trust your content. It should be clear and simple yet fulfilling enough for the visitor to end the search on your website, meaning they won’t look elsewhere for information. The majority of your posts should have a few keywords in it which you might base your article around. However, keywords should not be used in excess as your content is naturally being indexed and it needs to flow. Keywords are important but don’t lose sight of your niche and your visitor’s needs. Your content should not be a rewording of similar articles already ranked in Google. Do your research, read books articles and learn the ins and outs of your niche so you have a clear understanding yourself because you want to provide your visitors with new information or a new take on your niche. You need to be up to date with your chosen niche. Sign up for Google alerts or online magazines as part of your research before you start writing. Most people use keywords in excess, so every page or post will be loaded with keywords, making the content awkward to read and engage with meaning you eventually lose the interest of your visitor and the search engines. A good website is informative and helpful and is conscious of its visitors at all times. This means quality content. So before I go into more detail about some techniques you can use to research keywords, let me emphasize that keywords should not be your main focus! Most of the content you write is naturally being indexed anyway, so you need to keep the interested of your readership with flowing and useful content because that’s what Google looks for and that’s how you achieve high rankings! Using Google instant is a free and easy way to get an idea of what people are searching for in your niche. It’s great if you’re stuck for ideas on what your next article should be about. For example, If I had a website about ‘losing weight’, I would type that into Google to see what other people are searching for and Google will give me different phases people are searching the most. Google instant gives you a list of highly sought after keywords or popular search, but for people who have just created a new website a guide to keyword research will explain all the steps you need to follow. Your best bet for rankings is to go after ‘low hanging fruit’ keywords, these are low competition keywords which still bring in the visitors but you have a higher chance of attaining page one or two rankings in Google. To get to these keywords a more advanced tool such as the Wealthy Affiliate (WA) Keyword Tool can help you with this! There are about 14253 results for this particular keyword which is decent but a low competition keyword should have under 100 results. As you build more and more content around these low competition keywords, the numbers start adding up meaning more visitors and higher rankings. 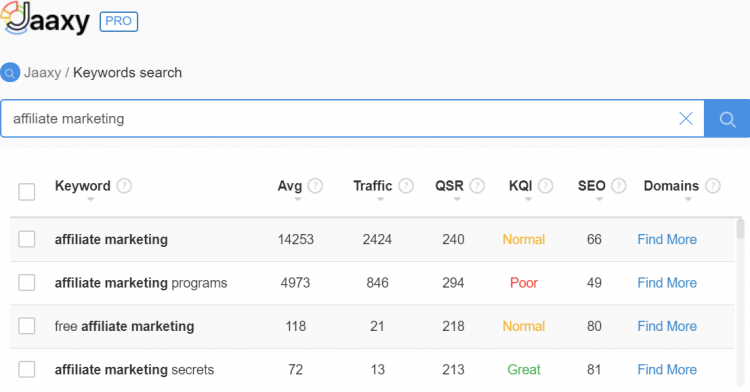 You might never use high competition keywords again! However, the WA Keyword Tool is not available for starter members but there is a free alternative that is just as awesome! JAAXY doesn’t have a sort option like the WA Keyword Tool, however, it does have an SEO column which gives you a score out of 100 on how likely a keyword will rank on the first page of Google, the higher you score, the better! JAAXY also has a related section to the right which is similar to the ‘Dig’ function on the WA Keyword Tool. The QSR column is similar to the ‘view results’ option, it tells you how many competing websites there are for a particular keyword, remember under 100 is ideal! There is also an awesome Domain function in JAAXY that tells you whether a domain is available for a certain keyword and there is a lot more other useful functions which make keyword research fast efficient and even fun! So JAAXY is a fantastic tool for you to make use off and whats better is that there is a free trial you can use which offers 30 free searches! That’s a lot of content ideas for free! I like to use JAXXY in conjunction with the Wealthy Affiliate Platform because there’s so much training available on the proper use of keywords, where to place them, how to search for them etc and much more! Although the WA free starter membership doesn’t offer the Keyword Tool, there’s still training available which you can use with your free JAAXY trial. How many searches are Good? There is really no fixed rule for the number of keywords, but if you are trying to rank a new website then the general rule is to find keywords with less than 100 competing sites and minimum 100 searches a month. But then, if you are producing good content, you can go for lower than 100 a month searches because every post you write ranks for more than 1 keyword. 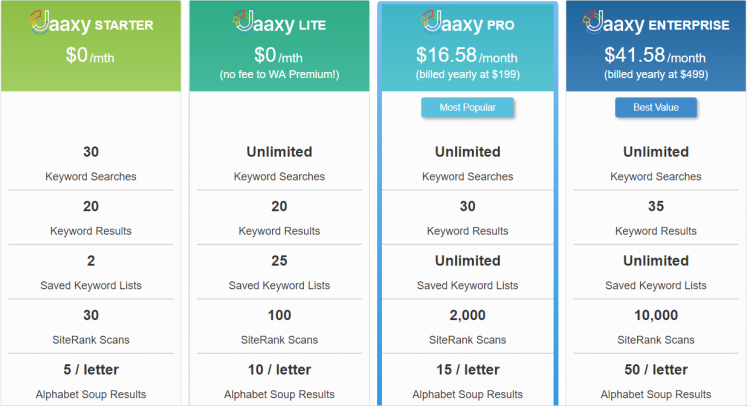 There are other programs out there that you can use to find targeted keywords, one I will recommend if you are not using Jaaxy is this program here, it`s a great tool and I wrote a review about it which you can read here but I can not justify paying so much for a keyword research tool. I hope this post will help you understand more about how to search for low hanging keywords that are easy to rank. Remember it takes abit longer for newer websites to rank and the more content you produce using any keyword tool on your choice and going for the best keywords, the higher your site will rank. Find phrases that other bloggers in your niche use the least, write a post that gets ranked high. Let me know how you get on with your free trials, or if you have any more questions, leave me a message below I’d love to hear some feedback.